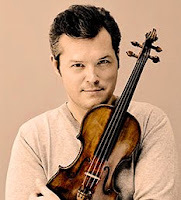 Vadim Repin is a Russian violinist born on August 31, 1971 (Perlman was 25 years old), in the same city as Maxim Vengerov. He began his studies with Zakhar Bron (in Novosibirsk) at the age of 5 and was soon recognized as a child prodigy. His first public performance with orchestra was made when he was 7. At age 11, he made his recital debuts in Moscow and St Petersburg, the same year he won the gold medal at the Wieniawski Violin Competition. In 1985, at age 14, he debuted in Munich, Berlin, Helsinki, and Tokyo. His Carnegie Hall debut took place when he was 15. He won the Queen Elizabeth Music Competition at age 17, the youngest winner ever. He is known for his interpretations of Russian music. Though he champions (and plays) contemporary works, his discography (on various labels) includes only the standard repertory – Mozart, Beethoven, Sibelius, Prokofiev, Shostakovitch, and Myaskovsky. He played a Guarneri del Gesu (1736) - until it ended up in the hands of Eugene Fodor - but previously (for about ten years) played Sarasate’s old Stradivarius, the Ruby Stradivarius (1708.) In 2010, the 1736 Guarnerius returned to Europe to be sold in the private market. It has been said that as a child, Repin played a rare ¾ Stradivarius, though it is thought by many experts that Stradivari never constructed any ¾ violins. YouTube has several videos of his concerts.